A solid compilation featuring exclusive and not-so-exclusive material from an international line up. Tracks from Straight to Hell, Scholastic Deth, Esperanza, Cockraoch, Self Defense, Diallo, Something in the Water, Totalitar, Balance of Terror, Last Security, Melee, and Vuur. Slick cover art, layout, photos of the bands and an informative essay about the purpose of this record. 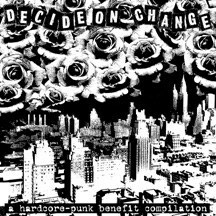 This compilation was released as a benefit effort for NYC More Gardens Coalition, an organization struggling to preserve 600 of the 740 current public gardens in NYC facing destruction by the city and real estate developers. Good rock and a good cause--definitely worth checking out.